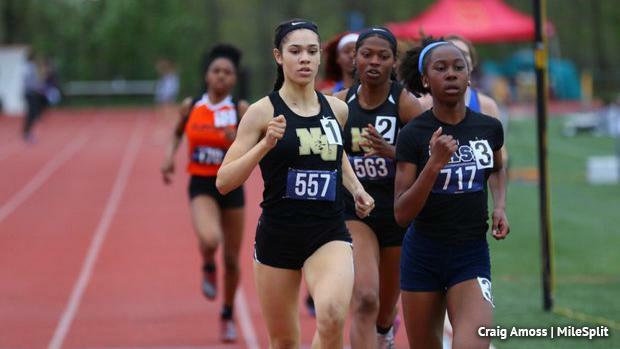 Neumann Goretti went down south to Maryland for the Bullis Bulldog Invitational and came away with four state-leading performances in what turned into quite the statement meet for the indoor team state champions. The Saints started the day off with a resounding win in the 4x800 meter relay, the event where NG won the indoor national title in the winter. The quartet went 9:18.81, lapping the entire field to their PA#1 and US#10 performance. In a loaded 400 meter field, Mykala Perry of NG went 55.14, over a second faster than her Bullis time from a year ago to take third. That time is a PA#1 and one of Perry's fastest quarter mile times of her career. NG's Kami Joi Hickson earned a hard-fought win in the 800 meters. In an exciting final lap with Saint Basil's freshman Alina LaForest, Hickson was able to kick through to the win and the state best time in 2:15.04. Then, NG closed out the day in arguably the squad's best event, the 4x400-meter relay. Neumann Goretti bettered their own state-leading time, popping a very quick 3:48.59 to take the win. Dasia Wilson got NG out well, and Perry brought it home for the victory and PA#1. Watch videos from all those PA#1 races from Bullis below, along with a list of all the elite performances by PA athletes at the meet.